Musicians, like film stars and television broadcasters, are some of the most important cultural icons in history. Furthermore, instruments can carry as much, if not more, powerful symbolism than musicians themselves. Take the electric guitar, for example, and Jimi Hendrix and Eric Clapton spring to mind. Or the piano: Elton John and Stevie Wonder. Or even the wobble board and, you guessed it, Rolf Harris pops up. In folk music, one of the prime instruments is of course the acoustic guitar (Neil Young, Bob Dylan, Joni Mitchell and Laura Marling are all a dab hand at it) but what about the harp? It’s not so common, Joanna Newsom aside, for this instrument to be the centrepiece, yet it has as much merit. 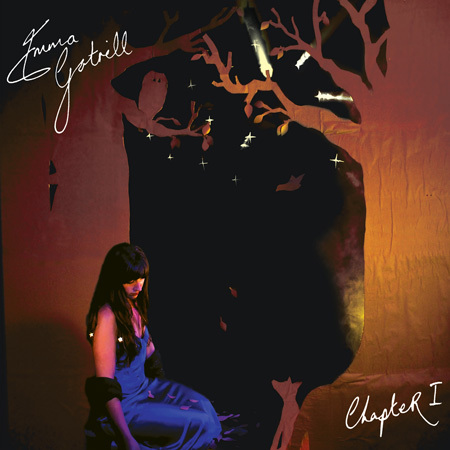 It’s also what really makes Emma Gatrill’s debut album, Chapter 1, stand out so much. Within moments of listening, it’s clear that Gatrill is substituting the traditional folk guitar for the harp and it’s to no detrimental effect. ‘Hold On’ allows the harp strings to flutter around Gatrill’s soft soprano vocals like a gently strum acoustic with a deeper mystique. It’s enjoyable to hear something different in a landscape where countless twee singer-songwriters have guitars glued to their fingertips. Gatrill’s voice is as equally captivating as her instrument of choice. Her quivering vocal always feels as if it’s just about to break; thawing at the higher notes in ‘Twisted Threads’ or cooing unpredictably in ‘Black Dog’. Gatrill’s known association with Rachel Dadd is completely understandable here; both artists trick the listener into thinking their voices will give way at any second while knowing they have complete control. The free rhythms of the majority of the songs on Chapter 1 are counteracted in ‘Jobe’ where drum rim taps and finger-clicks create wonderfully syncopated rhythms. Minor notes flux between the harp and the guitar and harmonies echo sounds of the occult. The movement in this track also breaks the album up at a clever point; some of the earlier songs’ liberal rhythms can become, paradoxically, a bit repetitive and stale. ‘The Birds’ has a darker, archaic feel, where Gatrill talks of lust and unrequited love: ‘I’m in love with a man whose wild heart runs free, I’m in love with a man who doesn’t love me.’ The literary references again come thick and fast, bowing down to the album’s apt title, with a brooding Heathcliff character running between Gatrill’s harp strings. Towards the end of the album lies ‘Soul Lovers’ with its sickly-sweet lyrics but charming musical texture and melody. Grave strings add depth to the airy, alternating harp rhythms and Gatrill litters the song with erratic notes that are strangely pleasant to listen to. She allows the music to run in a stream of consciousness like a poet’s mind to paper, and this musical freedom is inspiring and truly demonstrates Gatrill’s creative talent overall. With the harp at its core, Chapter 1 will unquestionably get people thinking about the ways in which different instruments can be used in folk music. The harp will not suddenly become the genre’s iconic instrument, but it should put Gatrill on the map. And deservingly so, too, because Chapter 1 is a sterling debut effort.